The importance of child safety in the context of their right to education and the responsibilities of the schools they belong to are a concern nowadays. Assuring the safety of students not only brings the serenity to school management and parents, but it also creates the school’s affability in the education sector. If the primary focus of school pertains to the safety of their students, more parents show their willingness to join their children into that school. This is the line of cerebration that rules “InnoSafeTag” Automatic Student Attendance and SMS Notification System. At the incipient, our attendance system devices mark the student attendance automatically and also send notification as SMS to parents instantly, it will assure the parents about their child safety. We are hoping, you will adopt our “InnoSafeTag” for best safety practice into your educational system. Those piles of registers and thousands of reports make school management very complex. The age-old strategies made the school management complex and less efficient to handle the job. Most of the schools are following old fashioned, less efficient methods to manage the school administration. In the era of digitalization, those old-fashioned strategies must be replaced with automation and increase the efficiency of the school administration. Our “InnoSafeTag” Automated Attendance System make School Management System more robust and more efficient to handle the tasks at ease. The InnoSafeTag Automatic School Attendance System is based on RFID and operates in wireless mode. The InnoSafeTag system is integrated with automatic SMS services,as soon as students walk through RFID scanners an SMS is sent to parents. The attendance of students is automatically captured and uploaded to the cloud. The school administrator can generate day, week and monthly reports instantly. Our InnoSafeTag interface is well evolved and blended with new technologies. We provide more visualizations for student reports and total attendance of the class and its subsections. We have an array of features to transform your School into The Smart School. School administration and management systems are very important and play strong and responsible roles in running the school with high potential. Though the administration work become a burden due to conventional methods that are being practiced ever since the beginning. 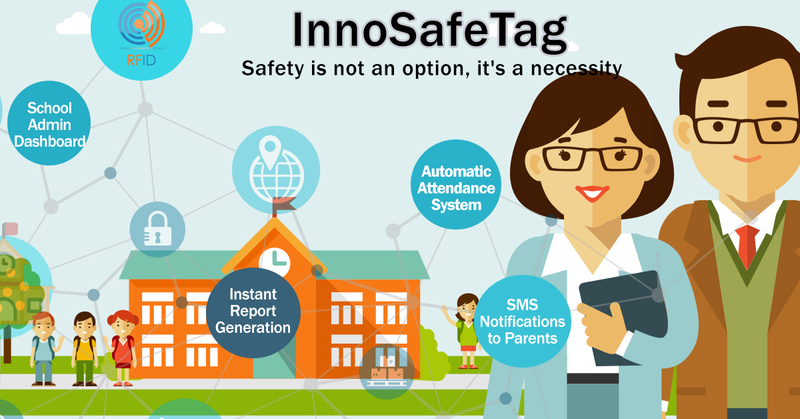 With InnoSafeTag, Schools record the attendance automatically and generate reports instantly. Our data visualization option is another handy feature to identify percentages of attendance in a blink of an eye. Repeatedly receiving similar complaints about a device failure will certainly not leave a good impression on the customer. Often devices get failed due to unknown reasons and the cost these companies incur to identify the reasons is huge In terms of manpower, it can reduce the unnecessary burden and helps in cycle process duration reduction of identification as well. Device Data Analytics using Artificial Intelligence and Machine Learning has its applications in various industries. One such application is“Battery Failure Root Cause Analysis using AI & ML”. In this present world, where safety of human beings and pollution free environment is given priority it has become necessary for companies and government to control emissions resulting from vehicles. Hence companies are moving from traditional fuel using cars/trucks to the vehicles running on batteries. Batteries at this critical point of time are often facing multiple failure issues. A battery when faces such failures, the battery prediction model accurately predicts the possible reason of failure using the AI/ML algorithm thereby removing the necessity of dissembling a battery to identify the cause of failure.. It also helps to send the report to developers who can act immediately. This cycle process duration can be reduced by 95%, and total transportation cost incurred, domain expert’s dependency can be reduced at a greater level with an accuracy of 85%. Over the past few years, AI has slowly trickled into domains which once were considered solely driven by human beings. One such area in an organizational set up is the HR and Recruitment department. This is a unit where Artificial Intelligence can potentially be used to accelerate and assist the human effort. From candidate acquisition to scanning resumes, to improving employee engagement and answering real-time questions at large, AI has the potential to revolutionize HR Industry. Today, employers like Google, Cisco, PepsiCo, Amazon along with major staffing agencies or TechHR startups are testing and adopting data-driven, predictive tools for better the hiring process. Recruiting is rarely a single decision as it is a series of smaller and sequential decisions. Recruiting has slowly become a digitized experience as candidates are connecting through mobile platforms. AI-powered technologies are much helpful at reducing the time spent on repetitive tasks and finding multiple patterns in large sets of data. Many Indian companies, especially large corporates in the technology, banking, and ITeS sectors, have started using AI-based chatbots to screen candidates and manage talent. Human error in the hiring process can inhibit diversity on teams, and as companies shift towards using artificial intelligence in hiring, algorithmic bias can as well. So, here we list some international and Indian companies using AI in their recruitment and how startups are helping them to use AI. The universe enormous organizations are using Chatbot to improve obligations and services. Utilizing the advanced technologies like Artificial Intelligence and Machine Learning, “Edubot” is education institutions related Chatbot which interacts and assists the customers to provide instant information on various queries. Now a day, it’s very difficult to stand in a help desk lane to get the information from schools and universities. 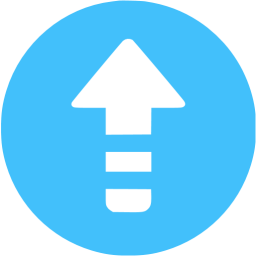 By using Edubot will get a quick response at any time and any place just by surfing on a school’s website. Edubot is very much helpful to assist customers if they need any information which is related to Courses and Curriculum. Edubot offers an ingenious solution to accomplish a new level of interaction with customers and wrap up the everyday assignments and cut down the extent of work for Admins and Faculty. Companies hire a number of employees every year. Companies invest money and time in training those employees, not just this but there are training programs within the companies for their existing employees as well. The aim of such programs is to increase the effectiveness of their employees. But where does HR Analytics fit in this? and is it just about improving the performance of the employees? 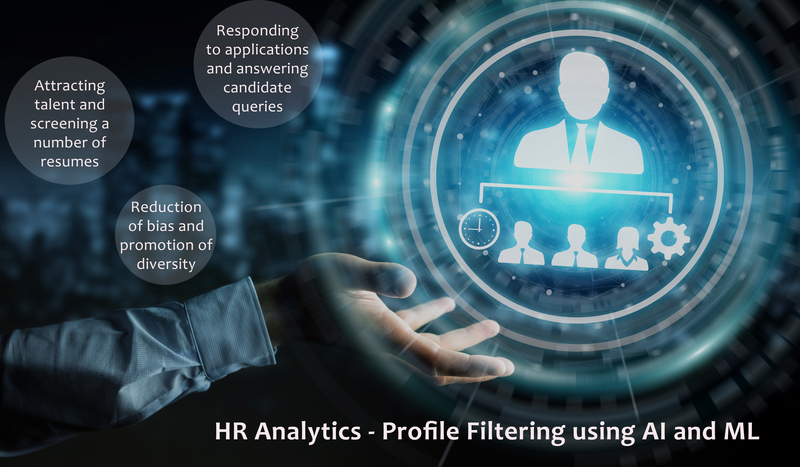 HR analytics is an area in the field of Analytics that refers to applying processes of data analytics to the human resource department of an organization in the hope of improving employee performance and thereby getting a better return on investment. Human Resources analytics does not just deal with gathering data on employee efficiency. Instead, its aim is to provide insight into each process by gathering the data and then using it to make relevant decisions about how to improve the processes. World is moving at a faster rate than expected. Many things are changing right from the way the items are manufactured to the way they are sold. Technology is the key ingredient without which the customer satisfaction and clients’ growth are impossible. MobiWeb Analytics of Innodatatics provides a sophisticated way of leveraging technology with the current world trend, to draw many actionable insights for the execution of quick and clear decisions. Our state-of-the-art advanced algorithms of MobiWeb Analytics take into account the information pertaining to google analytics, transactional data, data from social media etc., build predictive and descriptive models that amplifies customer satisfaction and improve sales. The reputation of an organization depends upon the time and quality it maintains in dealing with the customer. The service level agreements, quality and responsibility associated with the services, play a significant role. In general, each and every ticket is crucial and requires equal attention and focus. With improper knowledge base and improper diagnosis, there are chances of escalations, which will in-turn dent the reputation of the company/department. Digitization is penetrating into the remote parts of even the third world, in the recent times. With the advent of advanced technology and digitization, the data that is getting generated is very huge and the number of hands asking for queries on customer product/services is increasing at a very rapid pace. Keeping the current and future demand in mind, it will and is becoming a challenging task for the clients to satisfy their customers in responding to their queries. Copyright © 2017 Innodatatics Inc.